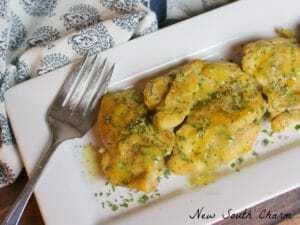 The sauce for this Honey Dijon Chicken is the perfect combination of tangy and sweet. 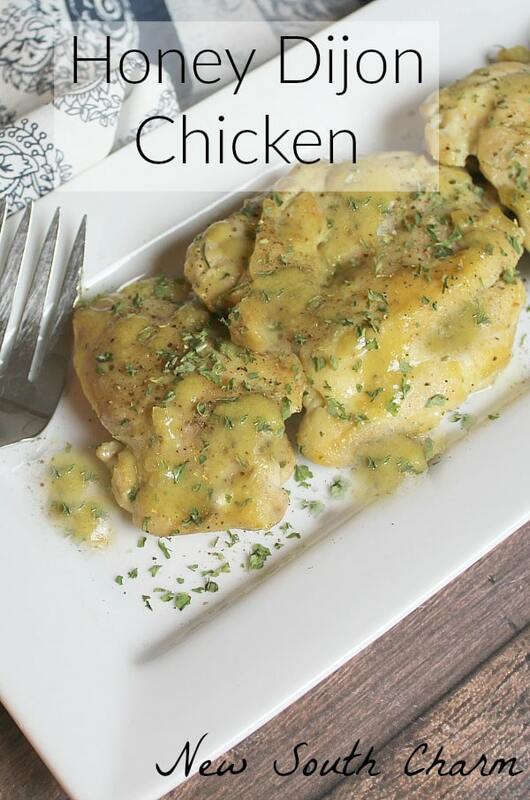 This recipe is perfect for chicken breasts or thighs and bakes in the oven in just 30 minutes. We eat a lot of chicken at my house. I personally prefer it over beef or pork. I do try to switch it around so we don’t get bored but still around here chicken is king. Of course there are countless ways to prepare chicken so it seem that it could never get old. But, you know how it goes, right? You’ve made the same stuff for years and you just need to break out of the rut. You could use any cut of chicken you have on hand for this recipe. I chose to pan fry a package of chicken thighs. The savory flavor of the dark meat went great with honey and Dijon mustard. I think that this sauce would be great with baked chicken breasts or even on grilled chicken. The star of this recipe is the sauce. It has a sweet flavor with a touch of tartness. It really gives the chicken a little kick and a lot of flavor. 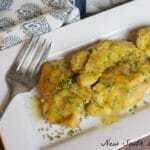 The sauce is made by combining Dijon mustard, honey, garlic, onion flakes, and water in a sauce pan. Then bringing the ingredients to a slow boil. Then pour over chicken and cook for a couple minutes. Making that all the chicken if covered by the sauce. After cooking the chicken in the sauce I garnish with freshly ground pepper and parsley flakes. My husband likes to spoon extra sauce from the bottom of the pan on his plate. So far I’ve managed to refrain from doing that but I may have tasted the sauce while it was cooking because it smelled so good. I hope that you will try this recipe and love it as much as we did. I know we’ll be having it again soon. Are you following New South Charm on Facebook? I’d love to hear from you; drop by and say hello! Heat a skillet and 1 teaspoon olive oil over medium heat. When skillet is ready add chicken and pan fry the thighs on both sides until cooked through. When chicken is done remove from heat and set aside. In a small sauce pan combine garlic, onion flakes, honey, Dijon mustard, water, and a little salt and pepper. Stir to combine. Bring to a slow boil over medium heat. Pour the Honey and Dijon sauce in the skillet making sure it covers the chicken. Return the skillet to the burner and cook for 5 minutes. Remove skillet from heat. Sprinkle with fresh ground black pepper and Parsley flakes (optional). Your Honey Dijon combination for your chicken looks fantastic! Thanks so much for sharing with Full Plate Thursday and have a fantastic day!